Today I'm sharing a tutorial from a new quarterly magazine, Farmhouse Style. 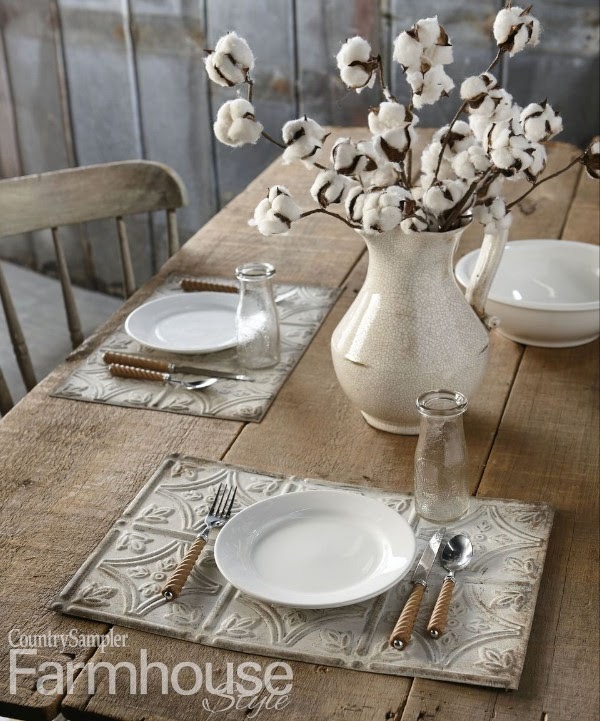 Farmhouse Style is created by the same people who brought you Country Sampler Magazine. Country Sampler’s Farmhouse Style magazine is filled with step-by-step DIY projects and creative decorating tips to create the farmhouse-style home of your dreams! Not only that, but each issue features tours into beautiful farm-style homes, tips and advice for simple homesteading such as raising backyard chickens or goats, features on innovative artists working with rustic materials, special articles for hosting backyard picnics, barn weddings and more! 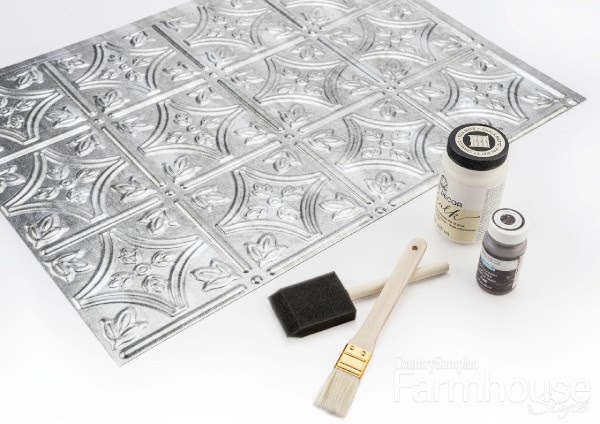 Dry brush over each place mat with off-white chalky-finish paint, leaving small areas of the metal tones underneath exposed. Let dry. 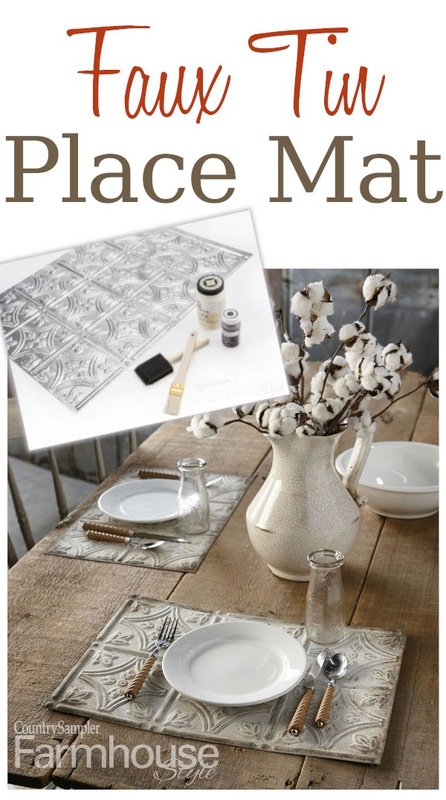 Lightly dab the corners and outer edges of the place mat with brown or rust chalky-finish paint. Then, lightly brush over the entire place mat, using minimal paint. Let dry. Lightly sand random areas to expose the metal tones underneath. Finish with a matte waterproof spray sealer. Farmhouse Style is available as a quarterly subscription as well as being on sale at newsstands nationwide, so everyone has the opportunity to pick up this popular new publication. 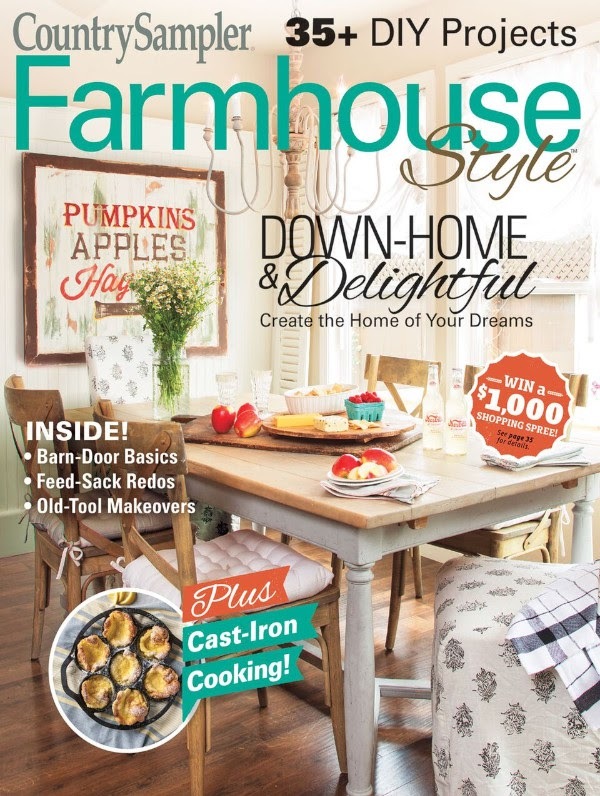 Charter subscribers can sign up for a subscription at www.FarmhouseStyleMag.com/Charter for one year at $19.98, or two years at $17.49 per year—that’s 56% off the cover price! Best of all, the publishers offer a 100% guarantee, so if you’re not satisfied with your subscription for any reason, they’ll refund your total cost, including issues you already received. How great is that! Mix textures for country-style success. From weathered barnwood and shiplap siding, to galvanized metal and chicken wire, to cozy quilts and braided rugs, your options are endless! Find easy ways to incorporate feed sacks, mason jars, egg baskets, chicken feeders, milk pails and other farm-style staples in your everyday decor. Make the most of flea-market finds! Get genius tips for repurposing items like old tin trays and dishes, wooden crates, reclaimed barnwood and more for uniquely vintage accents. Get great ideas for bring in the barnyard including canvas animal prints, vintage farm tools, milking stools and barn doors galore! Enjoy delicious, good-to-the-last-bite recipes featuring farm-to-table freshness and old-fashioned family dishes.